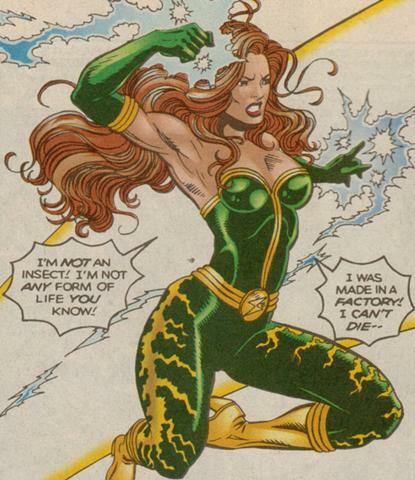 Created in collaboration with Harbinger for the Poison Ivy character. - Stage featuring elements from Batman comic books, heavily inspired by Rocksteady's Arkham Asylum game. - Check the Readme file for more information about this stage. Created in collaboration with Verz36 for Electro character. - 2 levels, Parallax, Superjump. part of MvsC UDB project. - Check the Readme file for more information about this stage and the updates. - Check the Readme file for more information about this stage and the new updates. them like in the previous version. 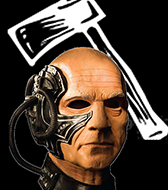 - We are the Borg, prepare to be assimilated to our laziness. Hey guys! Back from holidays. And 2015 starts with Electro receiving a update today with some new stuff and fixes. 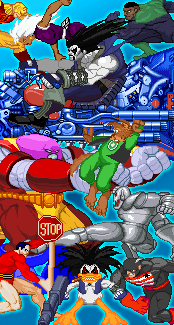 - Fixed and tweaked the 8 way air dash buffer for this move working properly. - Revision of overall character blockstun and recover frames, not safe as f@ck anymore. - Tweak on A.I. with more combos, still room for improvement. - Tweak on winposes duration. 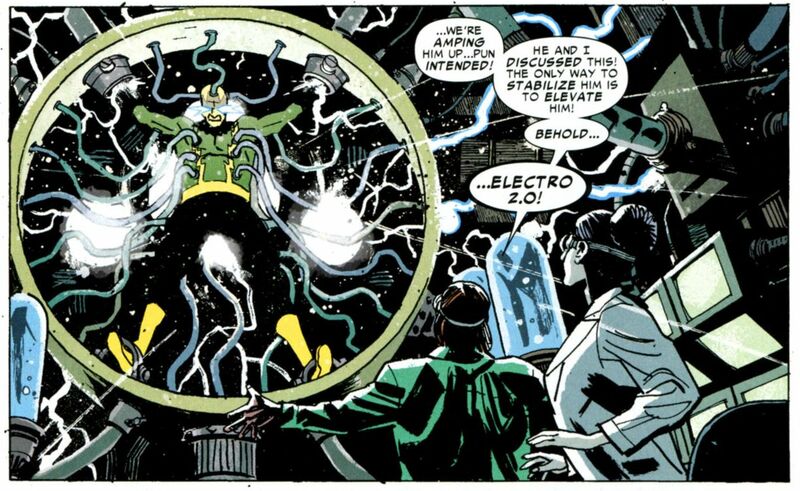 - Added new intro - the "Gauntlet" machine, the reason why Electro's powered up in comics now. - Added new animation after hover mode cancel... not looking weird anymore. - Tweak on palettes 10 & 11 with weird color issues. - Many other minor balance fixes and tweaks on code for a better experience overall. uploading a earlier version of this update in one of the mirrors here. please re-download again for the right file with all proper tweaks mentioned. no need to do it again... that was the right file. Electro Recharged by Loganir and Verz36. I can say it was not a easy wip because all the details and delays with real life stuff. Check his download page for Electro's command sheet, features and wip history. Enjoy and a Happy New 2015 Year!!!! This is a custom mvsc style stage heavily inspired on Rocksteady`s "Batman Arkham Asylum" game. You can grab it from stages section here. I've did this stage in collaboration with Harbinger. He contact me with a initial idea for a Ivy's themed stage and we cooked this stage so far. Harley and Ivy fans will notice the "easter egg" meaning here. Also the stage High Voltage for Electro received a small update, concerning the security guys velocity, a additional helicopter anim and other minor stuff. We wanted and had a initial plan to release Electro in the next couple of days but unfortunately some details still missing and i will not be around these next days and also Christmas... i need to go on a unexpected small trip with family. But don't worry, i will be back soon and release Electro with Verz36 before the New Years day. 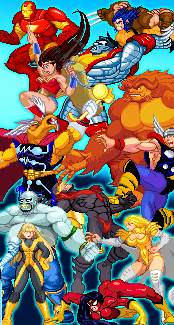 This is a optinal animation used for characters and i just finished these sprites a couple hours ago. Marvel call her Electrocute.. nice name huh! And yes... this chick really exists on Marvel Universe. I wish a Merry Christmas to you all and see you back in a few days! Hello guys! here's a video preview of Electro Recharged by Loganir & Verz36. Still a work in progress in need of some adjustments, AI and other minor stuff. His full hyperchain level 3 currently in the works, but a small part can be seen on this video. Working non stop these last days on Electro, hope you guys like this preview. Thanks to "Hype VoiceActing" who put a lot of soul on Electro voices. Hi guys! Yeah... it's been awhile. I was busy with several things on RL in these past months, that's why the lack of news here. 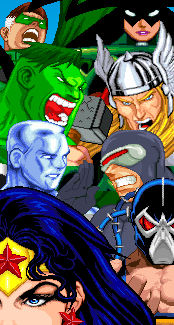 This is a new custom pixel portrait i did for Electro's winquote screen and mugen arcade modes. Like many of you guys know, Verz36 doing several new sprites for this char and I've been also working on new sprite edits and animations too. Besides this we both including details in the old frames and new additional transitions and new heads. So let me show some of the new sprites i've been working for this character. This is a example of a scratch sprite for a new move... i'm used to mix scratch work with custom sprite edits for full animations. These are some intros and winposes edits i made, don't bother the lack of spark lines for the first one... it's on the char alredy plus a explod with a high tension cable where he's absorbing energy before the fight. This is the "tiger" winpose that appeared in the first Electro post here, now finished...... so much colorloss on gifs like this one. Gonna consider making videos in the future, just not used or having time for it. This is the... Maximum Voltage. Would be more ironic if i put Spidey on this preview. 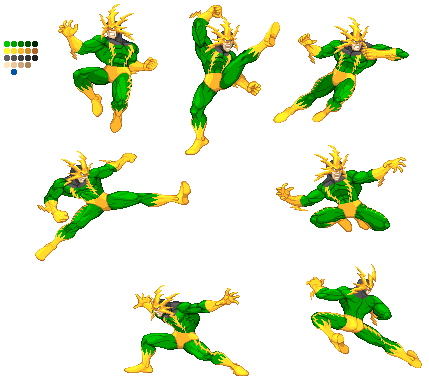 Electro sprite poses of this sequence are wonderfully done by Verz36. Teleport and fx edits by me. The pixel hyper portrait it's a new remixed version of Sei + Verz36 with a new head i've edited to fit the style of other portraits. However gif timing somehow doesn't look right here and currently there's something extra coded to this hyper. Custom Sprite edits by Verz36 for this hyper... can you guess the bases? Well i hope you guys like this small preview! We can't stop, won't stop...sucking up our free time. Cheers! © 2017 Loganir Mugen Projects. || Capcom, DC, Marvel, SNK contents © of their respective owners. Theme images by Ollustrator. Powered by Blogger.